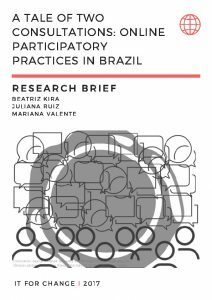 This paper gives an overview of the state of ICT-mediated citizen participation in Brazil. It looks at two online consultation processes, Marco da Civil Internet and Copyright Reform, initiated by the government to understand the impact of citizen participation through technology on governance in Brazil. 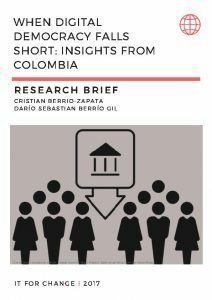 This paper examines the the impact of ICT mediation in democratisation and citizen engagement in Colombia. 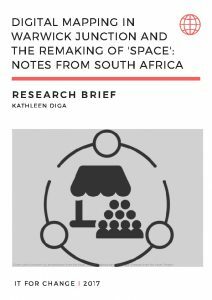 It looks at how these impacts can be understood in terms of governance, and if they have lead to democratisation in governance and political routines. 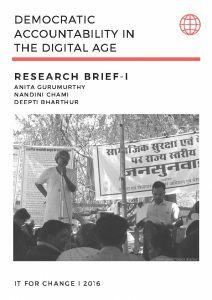 This paper summarises the key issues in the current digital governance scenario in India. 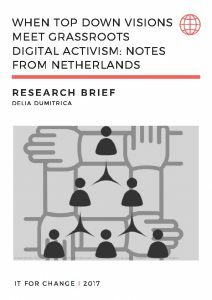 It focusses on emerging technological practices in government and articulates the gaps in current legal-policy measures necessary to promote participatory democracy in the digital age. 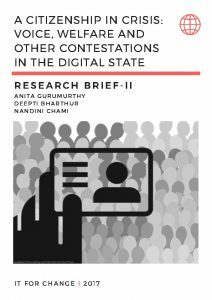 This paper examines the nature of e-governance in India, presents the implications of the changing nature of governance and state-citizen engagement particularly for groups at the margins, and makes suggestions for a digitalisation that strengthens participatory democracy in the country. This paper studies the integration of ICTs in the process of governance in the Netherlands. It looks at the Ons Geld (Our Money) initiative to understand the visions and opportunities technology-mediated governance creates for citizens engagement. This paper provides an overview of ICT-mediated and enabled citizen participation in the Philippines. It focusses on various technology backed initiatives like Open Data, led by the Philippines government and its impact on citizen involvement and public participation in the country. Though South Africa country has built ICT platforms for citizen engagement, access is restricted to a small set of wealthy citizens. This paper studies an NGO-led initiative which uses participatory mapping to help informal traders at Warwick Junction participate in a dialogue about their occupational health and safety with the government. This paper reflects on the critical role of ICTs in reconstructing politics in Spain. It examines Spain’s new experiments in participatory democracy; Decide Madrid launched in the city of Madrid to enable strategic participatory planning for the municipality and decidim.Barcelona another participatory process launched in Barcelona. 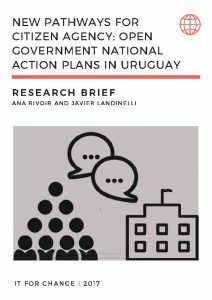 This research brief looks at the experience of open governance in Uruguay. It analyses the creation and implementation of the Open Government National Action Plans to understand its impact on citizen agency and participation in the country. Event: What is the Internet’s role in Brazilian politics?